A minority group, by definition, is a sociological category that is differentiated, defined, and often discriminated against by those who hold the majority of positions of social power (Boundless, 2014). The Deaf community is a minority group, yet there is a number of us who consider ourselves a part of another minority group. Being in two different minority groups, we are said to have two identities – Deaf and an identity being racial, sexual, religious or whatnot. How do we juggle our two identities? I have two identities. I am Deaf and openly gay. I have been a part of the Deaf community since birth, and it’s home for me. It’s where I know who I am albeit my sexual orientation. I have been humbled to meet so many people who are also a part of the Deaf community. I share my identity with other Deaf people around the world. It’s also where we understand the struggles we go through as a Deaf person. It’s where we support one another. It’s where we unite in order to fight for our rights to be recognised as equals. However, I only recently came out as a gay female on a public scale. I am yet to make the full immersion into the LGBT community in Sydney, although I am slowly dipping my feet into the waters. One step at a time. It’s a rather overwhelming experience, but I’ll get there someday. All in all, I am slowly learning how to juggle my two identities. I have met many Deaf people who are a part of another minority group. There are Deaf people who are a part of the Islamic community, and their lives are enriched for that because they are able to share their experience with other Deaf people. 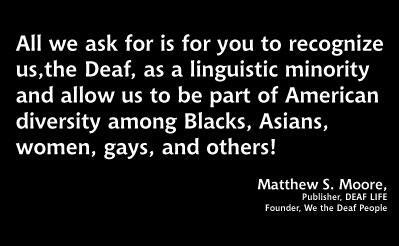 There are also Deaf people who are a part of the indigenous community, which is yet another minority group based on race. Some Deaf people have juggled two identities since birth. Deaf and African. Deaf and Japanese. Deaf and Indian. Deaf and transgender. Deaf and Christian. Deaf and Buddhist. You name it, and you are bound to know of someone who is juggling two identities. You could say that the Deaf community is multicultural – and I reckon it is. We do not realize it, but there is so many different cultures within the Deaf community, and for that we are able to enrich our culture. We are able to learn about how one another lives. We develop tolerance and respect for one another. Essentially, there is so many of us out there who are juggling two identities. Minority within minority – two groups becomes one based on our main identity. We are all Deaf.